GBC® ProCut 17P Automatic Cutter. Fully automatic and programmable, the ProCut 17P Automatic Programmable Cutter delivers improved productivity and enhanced user experience. The 17-inch automatic cutter is equipped with an easy-to-use LCD interface, making cutting jobs a cinch. All steel construction promises durability and reliability, while the LED optical line ensures the most accurate cut every time. Cuts up to 17.5" wide and 1.75" high. Full programmability up to 80 programs and 99 steps. Electric knife, clamp and back gauge included. Push-out feature moves media forward after the cut so operators don't need to reach under the knife. Reset button recalibrates machine for accuracy at every start-up or during operation. Two-handed cut clamp activation button. We have priced these as an additional add on below. Dimensions: 26 X 36.5 X 48. Wearable items include, but are not limited to: blades, sticks, staple heads, light bulbs, rubber rollers, belts, feed stones, separator pads, fuses, clutches, and brakes. About Print & Finishing Solutions. We are based out of Southern California and are in the Los Angeles time zone (GMT -8). Apoyo en español está disponible en todos los aspectos de nuestro negocio, incluyendo las partes del equipo y las ventas suministro, de servicios de equipos y servicio al cliente. En español está disponible en todos los aspectos de nuestro negocio, incluyendo las partes del equipo y las ventas suministro, de servicios de equipos y servicio al cliente. Party visit, please do so. Graphic-Arts Bindery and Finishing Machinery for the 21st Century. Print & Finishing Solutions for the 21st Century. Two Facilities to Serve You. We would be happy to answer your questions and concerns about a wide range of products. New, used, and refurbished machines. Retail, wholesale, corporate, and government pricing. As your business partner, the success of Print & Finishing Solutions relies on the success of our customers and vendors. This philosophy is reflected in our motto, Taking care of your business is our specialty. Our team approach promotes an atmosphere of cooperation, and our primary goal is to work together for success. It is the goal of PFS to support our customers and their print-related machinery for the long term with intelligent, well-trained sales and service personnel. 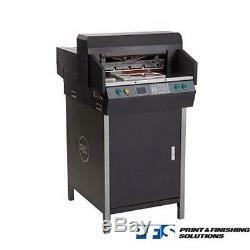 We have a complete line of presses and finishing equipment, including paper cutters, folders, drills, binders, collators, bookletmakers, cornerounders, hole punches, tabbers, joggers, punch and bind equipment, shrink wrap and packaging systems, staplers, stitchers, stock carts, padders, trimmers, perf / score / slit / number systems, and used machinery. Through the online program, customers can access the current BBB database to view the complaint history of businesses and check that a business has met all of the stringent BBB membership standards. NOTE: All of our items are processed same day by PFS. If you are worried about a lead time please ask us beforehand, and we will inform you of any backorders or additional manufacturing time. The item "GBC ProCut 17P Automatic Cutter" is in sale since Tuesday, August 11, 2015. This item is in the category "Business & Industrial\Printing & Graphic Arts\Bindery & Finishing Equipment\Paper Cutters & Trimmers". The seller is "printfs" and is located in Placentia, California. This item can be shipped to United States.